How can I get a strong, flat core? Tips that REALLY work. Seriously I think this is the #1 question that I get. Our culture is so focused on our mid section, and maybe for good reason since abdominal fat has been shown to be more dangerous to our health. Whether your concern over your abs is health or vanity related (or both) here are the tips to a flat stomach – they might surprise you. 1. The way you eat is #1. I made this point #1 because it is #1. You can super strong abs under a layer of fat – no core exercise will get rid of that fat – only cardio exercise and a good eating plan – not a diet- but a good eating lifestyle. More tips on this below. 2. Skip the long core only sessions. What? I am not against core classes (teach a 20 min one myself), but you don’t need to spend long sessions on your core several times a week. Total body compound movements like the deadlift, pushups, squats and pullups (visit bodybuilding.com for a demo on the correct way to perform these exercises) all work you core (if you are engaging it) which brings me to #3. 3. Learn to engage your core and still breathe! This may sound weird but this is step one to a strong, firm core. 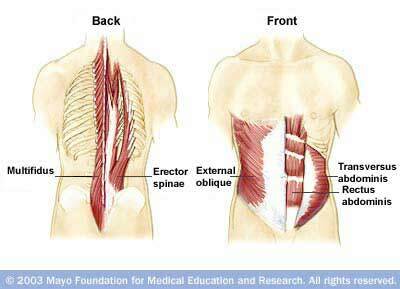 Engage your transverse abdominus by pulling your belly button in while standing up straight. Exhale on the exertion of the movement and follow with an inhale. Ex: Inhale while lowering into a squat and exhale onthe push to stand up-the exertion. 4. Use cardio interval training to burn the fat covering those abs: I am sure you have heard the buzz on interval training. It is a great fat burner and time saver. To get the metabolism boost start with a simple 15-20 min routine – outside walk/run or pretty much any cardio machine at your gym. After a 5 min warm up, alternate 20 sec all out effort (only able to talk in very short spurts) followed by 1-2 min moderate effort. As you progress play around with the timing … you don’t want your rest period to get easy and you don’t want your all out effort time to be so long you slow down toward the end. 5. Don’t forget your lower back! Your low back is part of your core too, so to create a strong allover core sue moves like supermans and bridges to work those muscles. Follow these rule and with some patience you will get a stronger and flatter midsection. No quick fix, but it will get you there, so hang in there for the long haul! « 7 Tips to help you REALLY reach your goals this year!